Newlywed Hilary Hendershott CFP® found herself with a limited cash flow after launching her own financial advisory firm, and started using her husband’s credit cards to make up the difference. What she considered to be a money secret she was keeping from her new husband, she discovered actually wasn’t, but was the catalyst that brought them together to discuss their finances as a married unit. I don't know if I'd found one of his credit cards laying around, or it was a credit card that I was using, or using intermittently. Well anyway, I started using this credit card to live off of. And this went on for months, and every time I pulled it out I felt like I was cheating or lying or stealing or something, but I was doing this thing that I didn't have agreement to do. You're listening to Financial Grownup. With me certified financial planner Bobbi Rebell, author of How to be a Financial Grownup. And you know what, being a grownup is really hard especially when it comes to money, but it's okay we're going to get there together. I'm going to bring you one money story from a financial grownup, one lesson, and then my take on how you can make it your own. We got this. Hey friends, so if you spend your significant other's money and you don't actively tell them that you are spending that money is that cheating? I'll let you guys be the judge. Quick welcome to our newest listeners and welcome back to everyone else. Hit that subscribe button while you are there. We do three short episodes a week to fit your schedule. Each episode delivers a money story from a high achiever, a lesson in takeaway so you can apply it to your own life, and an every day money tip to help you save and have more money. If you've got more than about 15 minutes feel free to binge, get a few lessons in a row. Okay, now to our guest, Hilary Hendershott. In addition to being the real deal, a certified financial planner who has been named one of Investopedia's Top 100 Financial Advisors she also hosts the Profit Boss Radio podcast, which I highly recommend. I'm going to be a guest on a future episode likely in the fall. She is also relatively newlywed but regrets keeping a secret from her new husband, or did she? Here is Hilary Hendershott. Hey Hilary Hendershott you're a financial grownup, welcome to the podcast. And congratulations, you are one of Investopedia's Top 100 Financial Advisors, quiet an honor. Isn't that cool? Yeah, I'm honored to be ranked. And you are a certified financial planner, which we know is serious business, and of course your hit podcast Profit Boss Radio podcast, which I am huge fan of. So, welcome. Thank you so much, I'm really happy to be a financial grownup today. And you brought with you a great story and a very interesting one with a little bit of a plot twist. You were apparently using your husband's credit cards without his knowledge, but there's a lot more of the story, tell us. So for many years I worked for my father's financial planning for about 15 years. I went out on my own in 2014, so I took my clients and I formed a registered investment advisory firm. So here I am, I'm a bootstrapping entrepreneur and my husband was very generous, he said, "Of course, don't pay yourself for a while." And I think any of you who've started a business you understand you just really feel like all that dry kindling needs to go back onto fan the flames of the fire that is your new business. So I was not drawing an income from my business. And you were relatively newlywed, correct? We got married in 2013, yes so we were newlyweds. My husband had his own banking system, I had my own banking system we didn't join accounts, so I had separate checking account from him. So, I didn't think about the fact that we had set this scenario up where there was no money coming into the account that I was spending from. And so, I get to the end like I didn't want to go below $1,000 in this account, but there's no money coming in. I'm like, "What am I going to do now?" Well I happen to ... I don't know if I'd found one of his credit cards laying around or it was a credit card that I was using or using intermittently. Well anyway, I started using this credit card to live off of. And this went on for months, and every time I pulled it out I felt like I was cheating, or lying, or stealing, or something, but I was doing this thing that I didn't have agreement to do. And finally I was like, "I have to come clean honey, I've been spending on your credit card to live." So wait, but you didn't tell him and you thought he didn't know. I was about to ask you, wait who's paying these bills? Doesn't he look at the bills? So the people have auto pay. No, he paid the bills and I just thought maybe he wasn't paying attention. I don't know that he combs the transactions at a detailed level. It wasn't like the portal was accounting for this is Hilary's card versus this is your card. I don't know what I thought, I was just in denial. I think I just probably wishing and hoping that my surreptitious little activities were not being found out by him. But of course, we're married it's all joint assets anyway, but it was just the fact that I hadn't asked him or gotten approval, it wasn't what we had planned. It wasn't what we said would happen. And I said to him, "How in the world were we designed? How did you think I was going to get money? How was money ever going to come into my accounts?" And he said something about me taking profit distributions from my business. And I said, "But I wasn't taking money out of the business." He and I just had very different expectations of what was happening from a cashflow management perspective, but it was very cool that he gave me a very soft landing, because when I did say, "I've been using your credit card to live." Awe that's so nice. So then how did it evolve? What system did you put in place? Well now I'm on payroll. Right, but I mean did you just say, "Well okay, we'll continue this"? Or did you just merge your accounts then? Or did it just continue where you were just still using his credit card but you guys were open about it? I think a little bit of both. I think he like wrote me a check for $20,000 or something so I had money in my checking account. And then we did create a joint account so I changed my bank over to his bank, and now I'm on payroll from the business. So, our personal finances evolved and grew, but we really should have been spending from the same bank account before that. But, yeah so we just kind of dealt with it step-by-step. So what is the lesson for our listeners from that? What is their takeaway? I think it's really common at the beginning of starting a business for someone's spouse to financially support them. And if you're going to do that you just want to be clear where's the pool of funds that you're actually spending from? And you want to be I think in communication, how much can I spend and have us still be on track for our plan? What is your expectation here? I think the problem was that Robert and I just didn't fully talk through the plan. What saved me was my need to be ... I really am fundamentally an honest person. I'm like, "Uh I need to come clean here." But being open and transparent communication with your partner, your spouse is your financial partner. And so, being able to talk about that really helps. And it sounds like he is really supportive of the business. Oh tremendously. I could not have done it without him. Yeah, absolutely. All right, I want to talk about your money tip because it is something that so many people don't even think twice about, they just assume it's the best thing to do, but maybe not always. Yeah, so when you buy a car from a dealership they give you this schedule of appointments that you're supposed to be on for maintenance and tune-ups, that's a major profit center for those dealerships, those maintenance garages, or fix it places. So, I just went on Yelp and I found a four and a half star local mechanic and we take our cars there. I don't think I've had more than about $100 in maintenance costs over the last seven to eight years. One time I could literally hear the brake discs grinding on each other and I brought the car in thinking I was going to spend ... I had mentally budgeted like $1,000. I was like, "Maybe it'll be like $700 but I don't want to be disappointed, so I'll mentally budget $1,000." The guy said, "I'm going to retool it, it costs $49." It's like I can't spend money at this place if I try to, so that's my tip. So what do you think goes on that people are always feeling like they have to go the dealerships? And full disclosure, when we bought our car we did pre-pay for a maintenance plan. And so, we are locked in because we've paid for it, to our dealer. It's just a problem of information and education. A lot of people in my world, I see come into my office with things inside their investment portfolio that they don't understand, or aren't good for them, or have hidden fees. And under the hood of the car is the same thing. I myself, I know nothing about vehicles. And so, you want to trust dealer just sold you your car. You've been sitting with them all Saturday afternoon and they say, "This is your maintenance schedule." And you don't want to have to think, "Well I'm being taken advantage of or there's a way I can get it for a quarter of the cost." But you know these are huge profit centers for the dealerships and in my experience is I feel that I've been personally taken advantage of because I didn't know what to say or what to ask for. Well what happened at the dealer that you got burned? I think getting really high ticket maintenance bills. Having to do things like, "Well, we removed the rotor," or whatever. And then you go, "Okay can I see the part?" Because somebody tells you that in order to be a critical consumer you need to ask for your old parts. And they go, "Well, it's already at the dump," or whatever. Just signs of lack of credibility. And it's been so long since I've been to a dealership that I definitely am not going to remember the details, but just the fact of my maintenance costs went from several thousand dollars a year to under $100. Great advice. All right, before I let you go, tell me a little more about Profit Boss Radio and your mission, and a little bit about the show, and where people can find you. Yes, so Profit Boss Radio is your wealth mastermind. So, I take all the best of what I've learned over 18 years as a certified financial planner. I do solo shows on technical topics like, how to debunk economic doomsayers. You know those articles that always say, "The stock market's going to fall. The stock market's a huge bubble." I pull those articles apart and talk through every line item of them so that you understand how to think about and what to do about them when you read them. We've had finance experts such as David Bach and Dan Ariely on the show. I interview everyday entrepreneurs and even some really incredible everyday women, so not media experts but women who have done just remarkable things in their own financial life. I interviewed a single mom, she was left with no money and three kids, she had literally no income and now she owns a major clothing studio and online business living in the house of her dreams having paid cash for all of her kid's college. She was just an incredible interview. So lots of different kinds of topics. The show is designed to empower you financially to take control of your money. Well I am a huge fan of the podcast and of you. Where can people find you and follow you? If you have room in your podcast lineup check out Profit Boss Radio wherever you find your podcast online. You can find me HilaryHendershott.com and that is Hilary with one l and Hendershott with two t's. Thank you so much, this was amazing. Okay everyone here is my take. The first year's of any relationship that merges finances romantic or not is always challenging. Financial Grownup Tip #1, Hilary did talk to her new husband about the fact that she would not have income in the early stages of her business, but then she didn't follow up with exactly how the cashflow would work. So it was an incomplete discussion. Don't assume that your partner is making the leap to the next step. While Hilary takes ownership of her actions and feels she should have told him she was spending on his account, and she should have, why didn't he point out the charges to her? Because here's the really alarming thing about this story, given that he did not ask her or anyone about the charges that were appearing on his bill, how did he know that they were not unauthorized charges from strangers, and that his credit card and/or identity had not been compromised? So Financial Grownup Tip #2, if more than one person in your family is using a credit card or even a debit card you need to really be communicating. So taking it beyond the spouse example, maybe to build credit you put your teenage child on a credit card, or some people may give a caregiver a debit card to pay for expenses for a child. Make sure that person is giving you receipts or at the very least communicating what their buying. You may assume that because for example, they shop at Walmart every charge from Walmart is legit and is theirs, but a smart thief might make charges at places you already shop thus avoiding detection. Just think about it. Thank you all for spending some time with us. Feel free to binge a little and check out some other episodes. Learn more about Financial Grownup at BobbiRebell.com/FinancialGrownupPodcast and do follow us on social media. I am on Twitter @BobbiRebell and on Instagram at Bobbi Rebell 1. Hilary's relationship with her hubby is still going strong as is her growing financial advisory business. 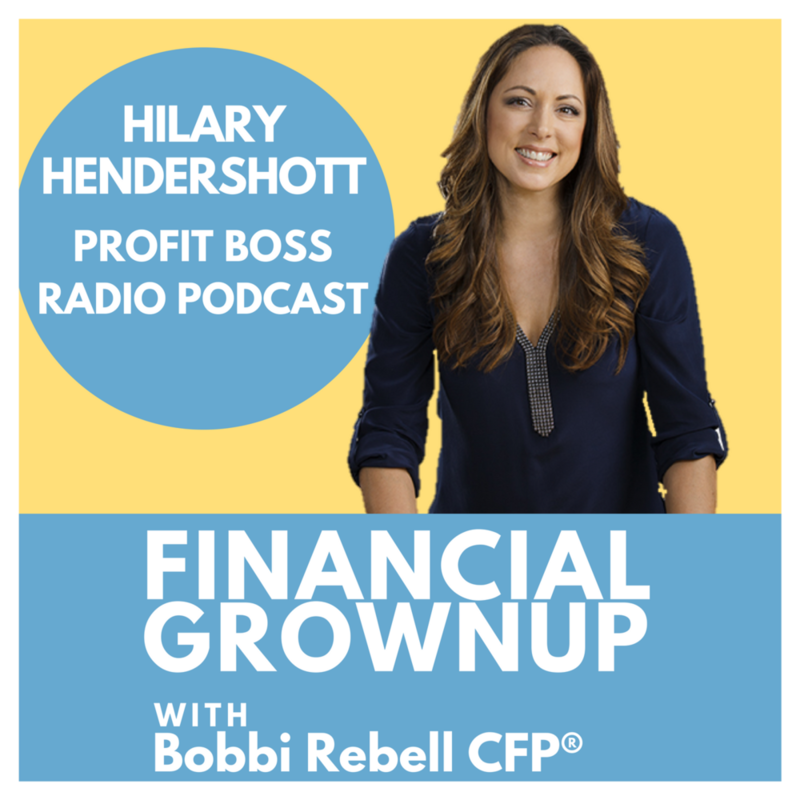 Be sure to check out Profit Boss Radio for more great insights from Hilary, and thank you to my friend for bringing us all one step closer to being Financial Grownups.